It is hot in my old country of Australia during summer. It is hot in my new country of Japan too. I had forgotten that it isn’t hot in England during summer. 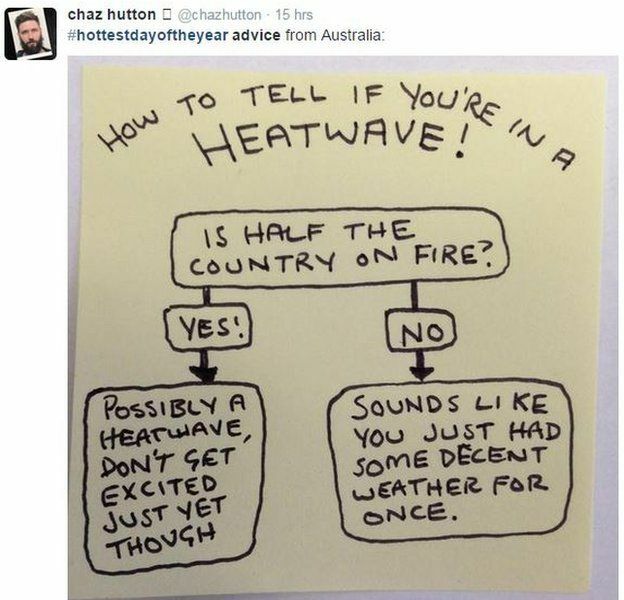 One Aussie’s comment on the UK heatwave published on the BBC! So far, I’ve had two problems. Firstly, since I didn’t specify the toiletries to take, I forgot deodorant. This meant I arrived at Kim and Vicky’s very, very smelly. Secondly, I believed the headlines and indeed, the day of my arrival, it did feel a bit hot. I was definitely hot on the train to New Eltham and this combined with my no deodorant problem, meant myself and the passengers surrounding me were particularly uncomfortable. The heatwave ended the day after I arrived as it rained. It hasn’t been hot since. I have been wearing my one pair of jeans and my one hoodie ever since. I went shopping to get some more clothes on Friday but all they are selling are ridiculously short shorts (the type you bottom falls out of) and skinny jeans. I can’t wear skinny jeans because I’m not skinny. So the shopping trip was a total failure and I’m now stuck wearing the same pair of jeans and the same hoodie until the 17th. Why the 17th you ask? Because that is the day of Ruth’s wedding and I’ll be wearing a summer dress, freezing my arse off and popping my jeans in the wash so they are ready for wear again the next ten days of my holiday! May have laughed out loud at the skinny jeans. Yup, haven’t bought those either this holiday. Try Oxfam shops for a good second hand sweater 🙂 saved my freezing self one winter in England before I knew people didn’t heat their houses really. Thanks for the tip Liz. I’ll be giving that a go!